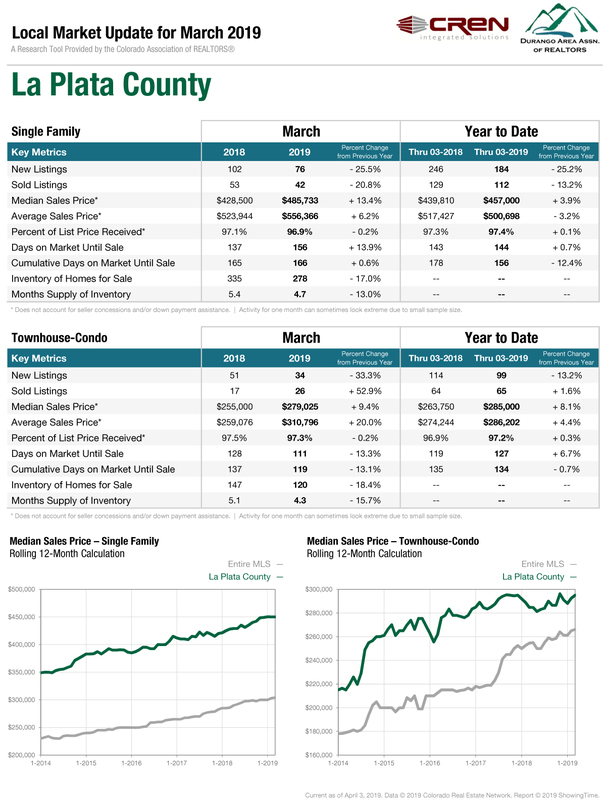 This week, we have the latest real estate numbers for La Plata County for the month of March. The attached charts show a detailed breakdown of several market segments in La Plata County, showing La Plata County as a whole, Durango In-Town, Durango Rural, Bayfield In-Town, Bayfield Rural, Ignacio In-Town, Ignacio Rural, and Durango Mountain Area. These charts indicate the statistics and key metrics for single family homes and townhouses/condos, including new listings, sold listings, median sales price, and more. They compare March 2019 to March 2018. We also see the rolling 12 month median sales price for single family homes and townhouses/condos in these segments. We always appreciate these charts to be able to spot trends within our local market, and compare results to previous years. La Plata County single family homes had a slower month in terms of total sales and new listings compared to March of 2018; however, the median sales price is higher this month compared to March of 2018. Year to date, we see the same trend: fewer new and sold listings, but a higher median sales price through March 2019 than through March 2018. The La Plata County townhouse/condo market had a standout month for both sold listings and median sales price, with a 52.9 percent change this March compared to last for total sold listings! Year to date, we also see a slight increase in new listings, and a substantial increase in median sales price through March of 2019 compared to through March 2018. We do see fewer new listings both this March compared to last, as well as year to date this year compared to year to date through last year. Durango In Town single family homes had more new listings this March compared to last, as well as a higher median sales price, although there was a slight drop in the total number of sold listings. Year to date, we see the Durango In Town single family home market reflect fewer new listings and sold listings, and a lower median sales price. The Durango In Town townhouse/condo market had more sold listings as well as a higher median sales price this March compared to last, and year to date we see the same trend: a higher number of sold listings as well as a higher median sales price. Durango Mountain Area townhouses/condos had an excellent month this March, as well. There were an even number of new listings, a higher total of sold listings, and a higher median sales price. Year to date, there were more new listings, sold listings, and a higher median sales price this year compared to last. As always, we encourage you to take a look at these charts to gain an understanding of each of the market segments. The townhouse/condo market had a strong March across the board, so it will be interesting to track this through the rest of the year. As always, please let us know if you have any questions. We will be hosting an open house on Sunday from 10-12 at 37 Lizard Head Drive. We would love you to stop by and say hello!